Making demos to clients or presenting them to management staff is an important job for many of us as entrepreneurs, developers, engineers, designers or product people. Despite the fact that there are many publications and books teaching us how to do great presentations I always get the feeling that I could have done it better. 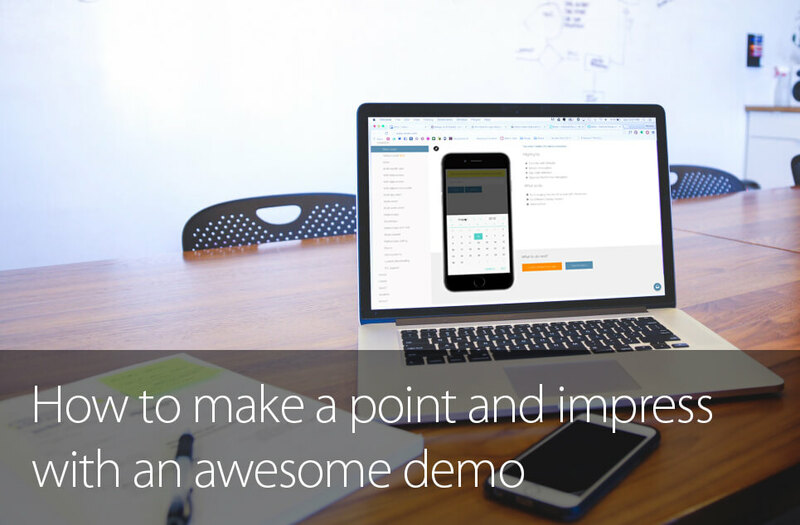 Beside the general guidelines that one must follow we gathered some tips and suggestions that might help you to prepare and present your next app demo. So first of all you should have a clear understanding of the problem that your demo is solving. Instead of enumerating all the features your demo app has (which is rather an inventory than a demo) you should focus on defining the problem and presenting how it is being solved. If you’re working on a new mobile app, present it on a real device if possible. If not, you have other options which can help bring it in context for your audience. You can present it either on a big screen or on your laptop, but the idea here is to show it as close to the final form as possible. Talking about a mobile app it is advisable to present it rather on a viewport close to the dimensions of a mobile phone or even better included in a telephone frame. Although the best option in this case is to present it on a real device on which the final app will run. This way your audience can see and feel the whole concept without putting effort to imagine how it would look on the targeted device. Preparing real, meaningful data is important so clients can easily recognize what you are holding a presentation of. Try to avoid loremipsums and example 1, example 2 use instead terms, names or definitions familiar to your audience. The final app will be used on the phone by the users interacting with it through the UI so it should be presented this way. is the product a stable one? can they have confidence in the new product? are all the requested features included? Your goal is to make the demo easily understandable so the audience can figure out the important steps effortlessly. Also keep in mind that you only have a limited time (up to 15 minutes or even less in a quick show and tell) to show the great final result. Keeping your presentation short and simple, straight-forward is important if you don’t want to overwhelm your audience with irrelevant stuff. They can get easily bored from all the details. Finish with “one more thing”, this can be a tip, a plus feature or improvement. Also leave time for your audience to ask questions. This way you can realize what they understood from the whole presentation and fill in the blanks. Remember your goal is to win the customers or the top management’s support and trust for your idea. You can have a great product if your demo is not winning your audience’s attention and they don’t understand what you are talking about. Communicate clearly and focus on the things your audience cares about. What are your tips and tricks for doing a great demo? Let us know in the comments below!